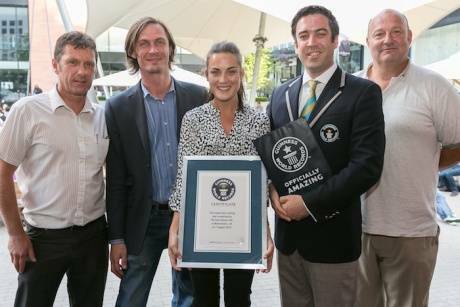 On a perfect Summer’s evening, 322 ale lovers convened in the Courtyard outside the Oast House – travelling from as far as Scotland – to assist with The Oast’s successful attempt to enter the Guinness Book of World Records. The previous Guinness World Record was held by Biergilde BNB in Arcen Netherlands who had 267 participants. Master of ceremonies was beer guru Warren McCoubrey who talked thirsty contenders through three samples from The Oast House’s beer selection. The three beers sampled came from local brewers Phoenix Brewery and were West Cost IPA, Arizona, Wobbly Bob. Curiously for the Guinness world record attempt Guinness wasn’t used. Phoenix ales are better anyway.